A volatile stock market to end the year in negative territory, the ongoing U.S.-China trade war, and a sputtering global economy have many travel executives fearing a looming economic slowdown. But for now, the travel industry is enjoying another year of solid gains. U.S. online travel growth continues to outpace the overall market, and this trend will continue until at least 2022. 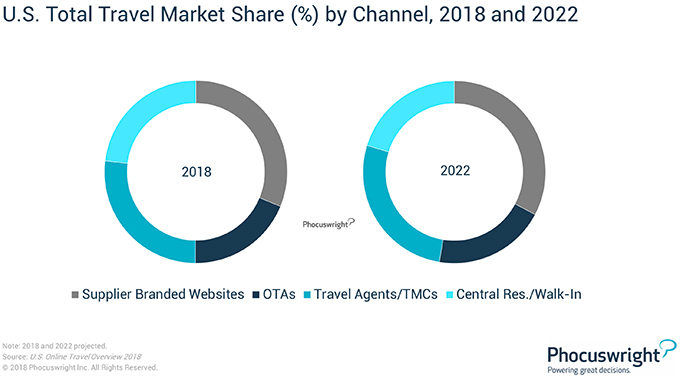 Although supplier websites are expected to grow slightly faster than online travel agencies (OTAs) in 2018, the online balance between suppliers and intermediaries will remain unchanged through 2022. Copyright 2019 Northstar Travel Media LLC. All rights reserved. From https://www.phocuswright.com. Analyst: Phocuswright Research.